One of the principles of agility is transparency - making the flow of work visible. It is common for the development team to use task boards and burndown charts, and we've found that extending this practice to the product management team is just as valuable. No surprise there. We have found this to be especially valuable, as the PO Team tends to be less agile due to their background. Most accept that the dev team is doing something weird and that they are required to provide different “specifications” but if you manage to set up a board and make their work more transparent, it is a vital step towards true agility for the POs and therefore for the whole organization. However, the PO Board itself has some subtleties that reflect the needs of the product management team. The PO Board provides the context for working on a specific product. In particular, by combining the product vision and the emerging requirements and features the PO Board allows incoming work to be simply and easily cross-checked with the product strategy, keeping a focus on the long-term aims of the product, rather than near-term distractions. 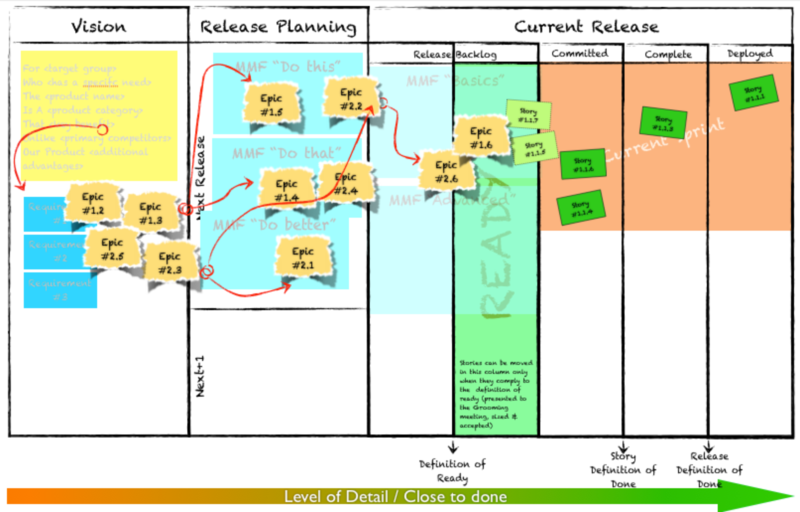 Starting with a clear description of the product vision, including the requirements identified to deliver on that vision, the PO Board always includes the contextual information required to decide whether a feature or work request should be included in the backlog and worked on by the product management team, let alone the development team. Beneath the product vision and requirements, we capture all feature requests associated with the product. At this stage, no prioritization is used. This is simply our someday-maybe pile for consideration in the future. As we begin release planning, the features in the someday-maybe pool are moved to the beginning of the task board in order of priority. Depending on the agreed process for integrating new ideas, the board will have a number of columns describing the stages a new idea goes through: investigation and sharing with the architects and technical leads, or the customers and stakeholders during the elicitation and definition process. The result is a feature board that exposes the progress made on defining, grooming, developing and deploying product features (see diagram). Starting from the top left, the highest priority feature is defined, split into stories, discussed and groomed with the team, and eventually enters the team's backlog. As we move down the board, we can see when the next release will be complete and what it, and the one or two releases after that, will contain. As we move across the board, we can see where each feature is in the definition process. Several things become clear when the PO Board is used. - First, the team no longer considers the grooming and backlog definition process something that happens right before the team starts work. The depth of research, requirements definition and preparatory work becomes much more clear. 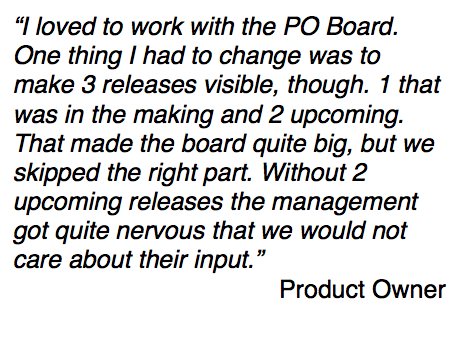 In fact, in one client we worked with, the PO Board allowed the organization to see how poorly staffed the product management team was (queues forming long before stories hit the development team's backlog). - Second, queues can be allowed where there are quality gates, traditionally defined by a form of Definition of Done, which helps clarify hand-off between columns (and in particular, between different teams/individuals): For stories ready to be groomed and sized, we use a Definition of Ready; For stories that are complete, but not fully integrated or acceptance tested, we use a Story Definition of Done; For stories accepted by the customer and ready for deployment, we use a Release Definition of Done. In conclusion, the transparency brought about by the PO Board brings to the PO team many of the benefits we see with development teams. It quickly exposes dysfunction, bottlenecks and inaccurate assumptions. It acts as a brake on starting urgent tasks over important tasks. It reinforces the need to focus on a small number of items at any one time. It encompasses the entire value chain, focussing on delivery to the customer rather than the development team. And of course, it introduces agile principles to teams outside core development.